Police have attacked video and photojournalists in Kathmandu on January 27 while covering a students' demonstration against the government. Half dozen photo and video journalists were taking video and photos of the torch rally organized by Nepal Student Union, the student wing of main opposition Nepali Congress at Bharikutimandap in the central capital. 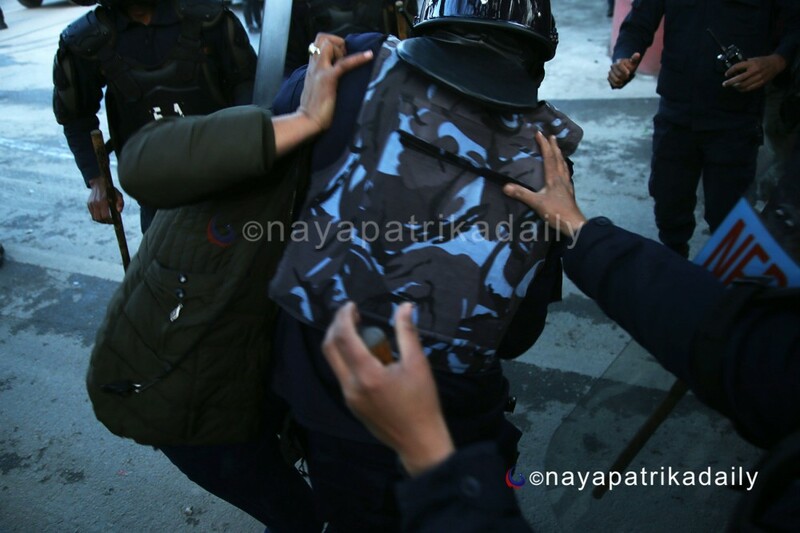 According to the journalists the police pushed them outside the Nepal Police Club at first then used force as the journalists entered at the premises of the Club along with the protesters, who were arrested by the police. “They misbehaved with us at first accusing of taking video and photo then used baton and boot to panic and chase us away,” said Katwal. Photojournalists Amul Thapa of Naya Patrika daily, Bijay Gajmer of Nagarik daily, Ujjwal Dangol of Nepal Samacharpatra daily and Samartha Ranjit of pahilopost.com were assaulted by the police. Freedom Forum vehemently condemns the incident for it is sheer violation of press freedom. The police persons must be aware and sensitive about reporter's rights to free reporting and safety of journalists during the protest. Also, journalists should adopt visible safety measures such as press card or press jacket to distinguish themselves from the crowd.